The Aspire ET- S is a pro style tank. It has an exterior metal sleeve surrounding the tank with two small windows that allow you to see how much liquid is left in the tank at all times. 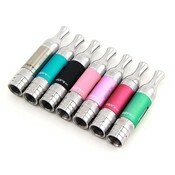 It is a clearomizer made of glass and metal. The Bottom Vertical Coil (BVC) churns out vapor like nobody's business. Easy To Maintain. My favorite to use so far.